South Florida wedding professionals to showcase products, services and new ideas in an intimate and elegant atmosphere. Brides can find the dress of their dreams, tuxes for their groom and many other creative wedding ideas. 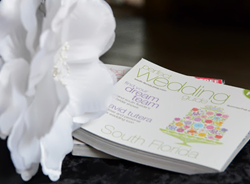 South Florida Perfect Wedding Guide, a locally targeted wedding planning publication devoted to connecting South Florida brides and wedding professionals since 2000, is hosting a bridal show at the beautiful Marriott Palm Beach Gardens on Sunday March 20th, 2016. Doors will be open from 1:00-4:00 p.m. This bridal show, produced by Perfect Wedding Guide, is sponsored by Complete Media Events, Alfred Angelo, Publix, the Marriott Palm Beach Gardens, South Party Rental, Cosmo & Company, Boca Express Travel and First Class Vacations. Brides-to-be and their fiances will enjoy meeting South Florida area wedding professionals who are eager to showcase their products, services and new ideas in an intimate and elegant atmosphere. Alfred Angelo will exhibit the latest bridal gowns for our strolling fashion show and two honeymoons will be given away along with many other exciting door prizes. Reception sites, caterers, hair and makeup artists, photographers, videographers and other wedding vendors will be in attendance to assist brides with their wedding plans. "Brides can find the dress of their dreams, tuxes for their groom and many other creative wedding ideas," says South Florida Perfect Wedding Guide publisher Ricki Black. "Additionally, they can order invitations and favors, see photographers' work, sample wedding cakes, book a reception site as well as plan the honeymoon all in one day." Each registered bride will receive a Perfect Wedding Guide tote bag and the latest issue of the Perfect Wedding Guide along with the chance to win thousands of dollars in door prizes. Tickets for the Perfect Wedding Guide Bridal Show are $10.00 at the door and guests can pre-register online at South Florida Perfect Wedding Guide. Pick up a copy of the Spring 2016 issue of the Perfect Wedding Guide magazine to find your $3.00 discount ticket good for your party. A discounted tickets voucher is also available on our Facebook page. For more information about the event, pictures, media passes, interviews, or vendor information, please call (561) 330-7899 x 201 or email ricki(at)pwgfl(dot)com. For over 24 years, Perfect Wedding Guide has been dedicated to creating innovative wedding planning solutions for brides of all budgets. Our company offers couples fun, useful, and FREE products to help make wedding planning less of a chore and more of a treat. Our local guides and bridal shows are available coast-to-coast in over 20 markets, showcasing some of country¹s top wedding vendors who work right in the bride¹s backyard. Our national website, PerfectWeddingGuide.com, is full of fresh planning tips and wedding ideas, wedding news, an extensive photo gallery for inspiration, easy-to-use wedding planning tools, as well as a wedding blog community hosted by our national wedding planning expert.